For those familiar with Wyckoff study would realize that operators typically want to ensure that the selling is fully absorbed before next move is orchestrated. This concept is visible across various time frames and I noticed this at play in Sintex Industries daily chart. This post is just to highlight this simple concept which would offer low-cost trading opportunity. This post is not a trade recommendation and only an endeavor to highlight the concept of absorption of selling. Have a look at the daily chart of Sintex Industries featured below. Have a look at the shaded portion in the chart above. Price has been consolidating in a range for a while. And notice the spikes above and below this range with attendant volume signature. The moment you notice a big move with huge volume at a crucial price level, it is imperative that you get a follow-through. If the follow-through is not coming by, then it could well be a fake or false move. Big investors wanting to accumulate huge position have to use all the tricks in the book to get their orders filled at the best possible price. These shakeouts are one of the primary method to get cheap orders. Notice how price dropped sharply, on the back of large volume, to the lower end of the range. If that was indeed selling pressure, price ought not to have opened gap-up the next day. The fact that price opened up higher with a gap, was a sign that the selling witnessed the previous day was absorbed by willing buyers. These buyers typically want to ensure that residual sellers at that price zone have been absorbed before marking up the price. It is therefore not surprising that price revisits that erstwhile high-volume zone and typically the volume tends to dry-up on each subsequent test. You can notice this happening in Sintex chart too. The second test, highlighted in the chart, is again on high volumes. It would therefore be prudent to await another test of that zone, which does materialise soon. On the final test prior to the rally, we see a classic “spring” wherein price edges below the lower end of the range which is also the area where sellers were aggressively mopping up supply earlier. Price closes at the lows but with very low volume. Other than the drop in volume, the other important clue is the immediate reversal in price and bounce back into the trading range, which indicates the poke lower was just one final test by big-investors (aka smart money) to check if sellers are still lurking around. Once they find absolutely no interest from sellers to push price down, it is fairly easy to push price up. This typically marks the beginning of the Wyckoff- “Mark-up” phase. Look at other classic wyckoff trading range and try to identify this testing action and “Spring”. It would offer low-risk entry opportunities once you know what you are looking for. It requires a bit of practice to study these charts and patterns. But the effort would be truly rewarding. The bullish case presented in the previous post has been invalidated by the subsequent price action. All the items in the check-list featured in the previous post has been checked. This in effect invalidates the short-term bullish view. Let’s take a fresh view and decipher what is in store for the Nifty. If you are just keen to know my view (and not the rationale) then head straight to the last paragraph. If you are keen to know the logic behind my view, then read through the rest of this post. From the daily chart of the Nifty featured above, it is apparent that the index has made a lower high at 8,969 (on a bigger picture), in relation to the all time high of 9,119.20. If that is the case, expect the price to eventually head to the middle line or the medianline line of the red pitchfork at 7,450 or lower. This scenario is not however the preferred case scenario yet. Why do I say so? The charts presented below would indicate that there is a strong support at 7,725-7,850 range. The two black dotted line represent the price level which has maximum entries of “Xs” & “Os”. This is analogous / proxy to the “Point-Of-Control” or POC in Market Profile parlance. This high volume node is quite significant in terms of support and resistance. Just to allay any doubt about the significance of these levels, have a look at the chart presented below which captures the similar level for the minor swing down from 8,969 to the recent low of 8,002. If you notice, price turned lower last week at the same black dotted level highlighted in the chart above. Hope this reinforces the significance of this line. So, unless we break this strong zone of support at 7,725-7,850, I would not expect price to slide to the medianline of the red fork. From the immediate short-term perspective, a fall below the recent low of 8,002 would indicate that the price is headed to the support zone of 7,725-7,850, which by the way is the preferred case scenario. The other (less probable) bullish case scenario is that a low is in place at 8,002 and price is now headed to higher levels. For this scenario to play out, price has to move past the high of 8,600. This would ensure that a bullish sequence of higher highs and higher lows is in place. And, more importantly, a breakout past 8,600 would also result in a breakout past the 45-degree red bearish resistance line highlighted in the above chart. Preferred View: Price headed to 7,725-7,850 zone. This would be confirmed if the Nifty breaks below 8,002. Alternate, Less probable View: Worst case is over and Price headed higher. A move past 8,600 would strengthen the case for this scenario. Expect an update when either 7,725 or 8,600 is breached. Nifty: Is a Top in Place ? Quite a lot has been written about the Nifty since the 86-point fall on Friday. As always, there has been all sorts of views doing the rounds in the social media and I just wanted to join the bandwagon to air my thoughts. A 86-point fall near prior market peak and a crack in the US-markets have caused alarm bells to ring aloud. Is there a case to be cautious? Definitely yes, more so if one looks at the weekly Nifty chart featured below. Irrespective of the choice of the “A”-Pivot, the interpretation is straightforward. Price has hit the medianline (#Andrews101) and has formed a selling-tail which is not a positive sign. When price hits the medianline, it can congest, reverse or sail through the medianline and move ahead. Of the three scenarios, the third one is least likely in the current environment. So, Nifty can either congest or get into a trend reversal or a downtrend. If it congests, there is nothing to worry as it would typically lead to a continuation of the prior trend, which in this case is a bullish outcome. We therefore have to be concerned with the other scenario which is the possibility of a trend reversal. Have a look at the chart featured below. I have drawn a “What-If” pitchfork, assuming that a top is in place for the Nifty. If this scenario is valid, price will typically run into trouble at the upper parallel. Any rejection candle or a selling tail at the upper parallel would make me cautious and I would tighten stops or lighten my long positions. I just wanted to provide the context for being cautious but I am not in the camp calling for either a significant top or trend reversal in the Nifty. If you ask me why, let me address that question via a few charts. Hope the above charts provide some relief to the worried bullish-camp. To Summarise: There is a case to be worried but a dose of caution is always a good thing to have. However, there is no reason to call for a market top yet, based on the evidence available thus far. What will make me bearish or at least worried? I would get worried and probably abandon my thoughts of a rally to 9,350-9,400 if one or more items in the the above checklist gets ticked. In the meanwhile, I will be watching what price does at the support zones at 8,760-8,780 and 8,630-8,650 zone. I realise that the support zones and the swing low at 8,540 is quite some distance away form where price is today. But, am talking about medium to long term perspective and guess these levels would be more palatable for the participants in that time frame. For the short-term traders, I have nothing to offer as I am less interested in that time frame. I will do a follow-up post if that checklist gets ticked. If I don’t, then please feel free to alert me via email or twitter. Hindustan Unilever: How Good Was The Earnings Scorecard? Hindustan Unilever presented its quarterly earnings scorecard just before market close today. The stock closed on a weak note and in this context the above question above assumes significance. While I am not a fundamental expert to address that question, let us look at how the stock and the Nifty FMCG index have performed recently. The purpose behind this post is try and glean information that these charts broadcast and come to some logical conclusion based on the findings. So, shall we get started? 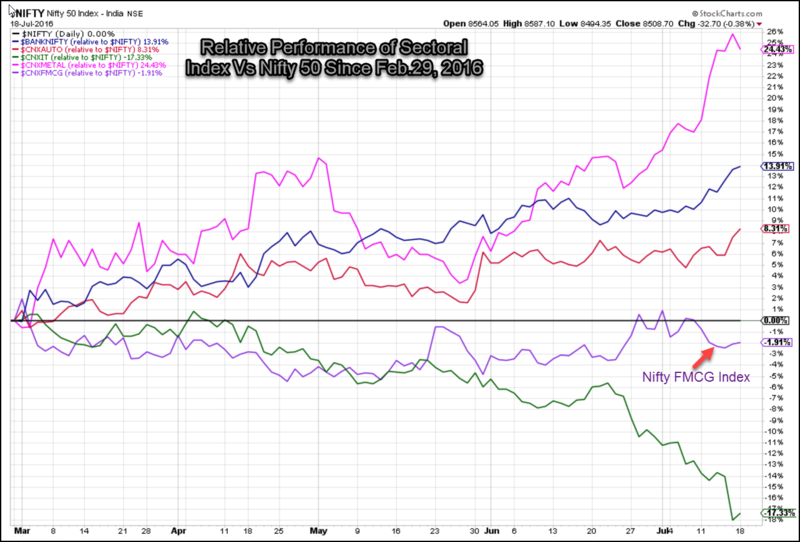 The above chart captures the performance of a few sectoral index in relation to the Nifty 50. While the Nifty Metal Index is right at the top and it is no surprise as the likes of Tata Steel, Hindalco, Vedanta and JSW Steel have logged stupendous gains since Budget-lows. On the contrary, the Nifty FMCG index (represented by the purple line) has been a relative under-performer versus the Nifty 50 since February 29 lows. So there is basically no reason to be excited about this sector or the underlying stocks as they have not done anything spectacular versus the benchmark. Let’s see how the Hindustan Unilever Stock has fared versus the Nifty 50. Presented below is the relative performance of the stock in relation to the Nifty 50, presented in the 3-Line Break chart format. This chart is sort of similar to Point & Figure Chart in that it tries to eliminate noise. I have used the TradePoint software developed by www.Definedge.com to plot this chart. Note how the chart has been in a downtrend since late-February when the stock broke below its prior swing low, heralding a phase of under-performance. After a brief recovery in the recent weeks, there is a sharp fall today, suggesting that the recent recovery is probably over. Unless there is a move past the recent highs in this chart, there is no reason to be bullish on Hindustan Unilever. Why do I say that? A move past the recent high would mean that the Hindustan Unilever has started outperforming the Nifty and it makes sense to look at the Hindustan Unilever price chart for fresh buy signals. Until that happens, there is little reason to focus our time and energy on this stock. Let’s take a quick look at the price chart of Hindustan Unilever. The stock seems to be in a trading range and in Wyckoff terms, we need to wait and watch if this turns out to be Re-Accumulation phase or a distribution phase. Check the chart of Maruti Suzuki for an example of what Distribution means and at HDFC Bank or Mahindra & Mahindra for what a probable Re-Accumulation phase would look like. Either which way, if our hypothesis of a trading range is correct, then the stock is likely to be stuck in this range for a while before the next trending move happens. The high of the range at Rs.981 and the low at 769-ish would be the broad markers to pay attention to. A breach of either of these levels is when I would get interested in taking a trading / investment position in the stock. Should I Hold or Sell Hindustan Unilever? The purpose of this post is not to address the above question. And, I am also not keen to address this question in this forum as I am not a SEBI-Registered Analyst. The idea behind this post is to draw attention to relative performance charts and how they can be helpful in identifying right stocks and sectors.